All our online printing is full colour CMYK litho, with a 3-7 day lead time, depending on whether your order cheap business cards, cheap comp slips, cheap leaflets, cheap flyers or cheap folded leaflets. But not only do we offer low cost lithographic printing online, we also offer same day and next day printing on many products, including letterheads, compliment slips, leaflets and flyers. 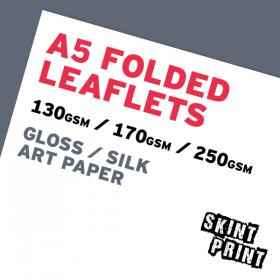 24 hour leaflets and 24 hour flyers are a reality with Skint Print. Get in touch for more info.